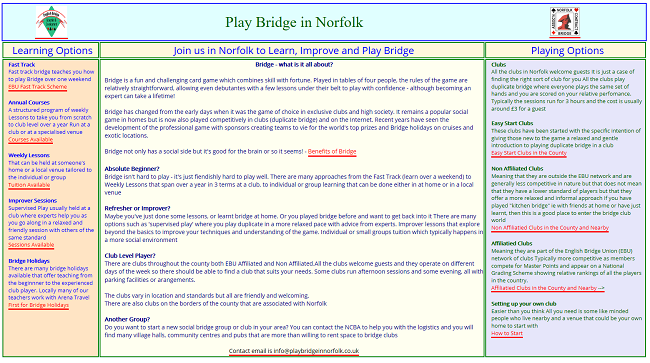 Bridge is a lot of fun and getting people to learn the game in your club may not be too difficult. It is also well-known that new bridge players must be offered some form of gentle, supervised play before venturing into one of the club’s main sessions. The truth though is this: the club’s membership development is not complete until some of those players migrate to a main session. Otherwise, they are not fully integrated, nor are they helping to address problems of low numbers. There are several reasons why this is a challenge. One of the basic ones is speed of play. 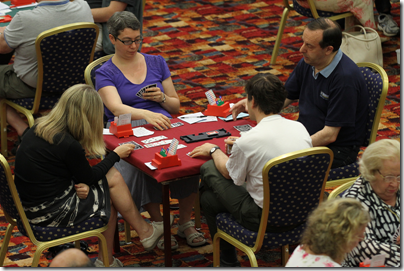 Playing a board in 7 to 8 minutes is stressful if you are not used to it, and experienced players may not be aware how many things which seem obvious to them take time for a beginner to work out. Introducing players to the main club sessions is essential though, and we have prepared some tips on how to do it here. What does someone do if they want to learn bridge, or find out more about it, but do not have existing contacts in the bridge world? Such people will likely turn to a web search and may end up contacting a local club, or finding the EBU’s site or one of any number of bridge sites out there on the web. 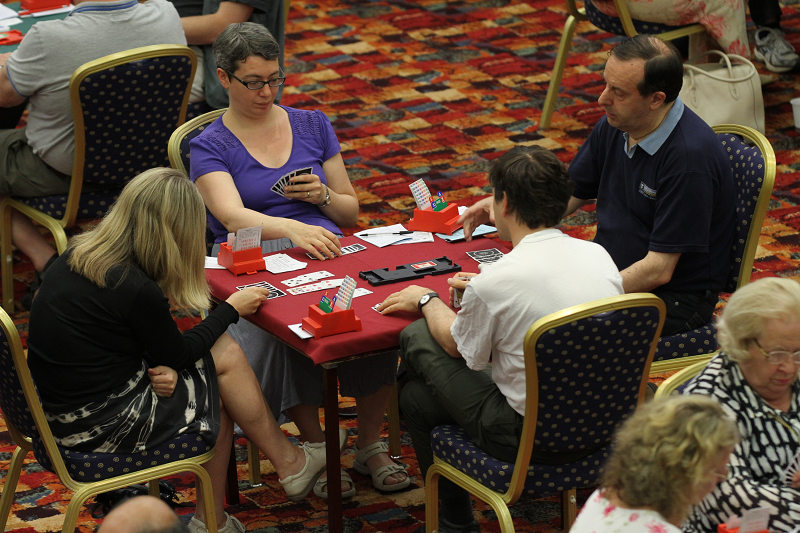 It can often be surprisingly difficult to get basic information on where you can learn bridge in your area, which is why we recommend having the county association, or a group of clubs, set up a web site dedicated to that purpose. General bridge sites and club sites tend to be dominated (understandably) by results, news of events, and information that looks quite specialist and perhaps off-putting to a casual visitor. Here are a few examples. 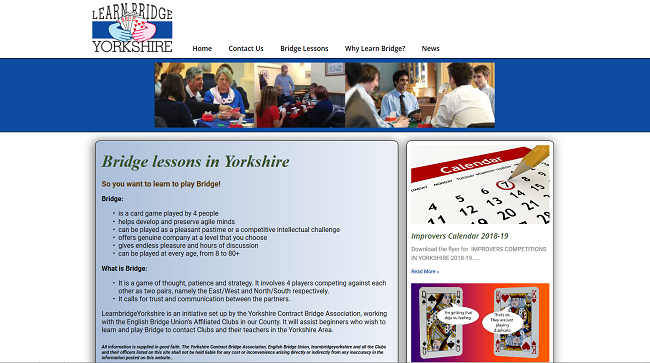 Learn Bridge Yorkshire was used in the Yorkshire membership development pilot and remains a very active site. You can see immediately the basic ingredients. It comes straight to the point: how can you find bridge lessons in Yorkshire. It has contact details, background on why learning bridge is a great idea, and schedules of where and when bridge lessons are available. It is also bright and friendly. Another example is South Notts Bridge. This site was put together by four clubs in South Nottinghamshire who decided to do something about declining membership. There is news of an open day coming up soon, background on the game and its (inexpensive) cost, and clear direction on who to contact for more information. Another up and coming site is from Norfolk. 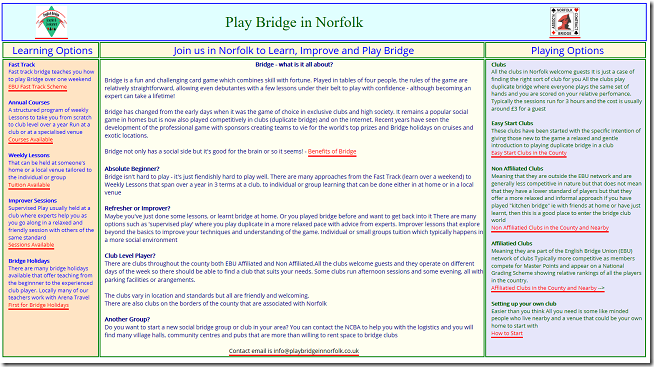 Play bridge in Norfolk sets out the options for playing bridge in the area, has background on the game, and explains what to do next in order to get involved. 1. Try to include some pictures. We can provide images to EBU affiliated clubs or county associations for which permission is clear, or better still, use your own (or a combination), to give a local feel. 2. If possible, support SSL connection which encrypts the traffic. Google will downgrade sites that do not work over https. 3. Make sure your site works well on tablets and mobile phones as well as PCs. The easiest way is to use a template that provides such support automatically. 4. Keep it simple. A clear message and immediate call to action is much more effective than long explanations.